With such a varied estate the process had to be planned to perfection and a bespoke redecoration scheme developed for every club. 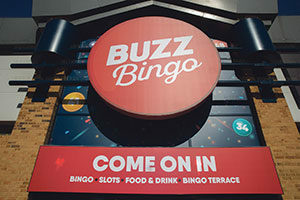 The team at Buzz Bingo provided clear instructions for each individual site from Plymouth to Colchester. 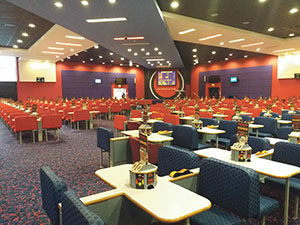 All customer facing areas including the lobby, bingo sales area and bingo hall were highlighted for redecoration with a contemporary colour palette of dusky pinks and greys. 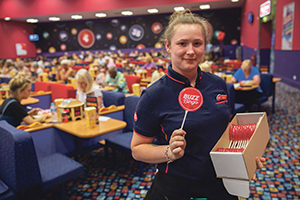 From the outset the remit was absolutely clear, that while delivering the rebranding programme, the wellbeing of the Buzz Bingo customers was paramount. Bagnalls therefore arranged its safe systems of work to eliminate any impact the redecoration works would have on the daily influx of customers. Of particular importance was maintaining a quiet working environment at all times, even though works were undertaken while the club remained open to the public. To meet this requirement, the local site teams avoided painting in the bingo halls during peak playing times. Also, key to the success of the project was the support provided by the paint manufacturer, PPG Architectural coatings, which provided a Johnstones Trade paint specification to meet the needs of Buzz Bingo. Special batch mixes of the accent red used to match the Buzz Bingo branding were manufactured at its site in Birstall to ensure the colour and sheen of the new branding. Bagnalls is a national painting, decorating and specialist coatings contractor, with 16 branch locations in the UK. Established in 1875 the company remains family owned and managed. For further information, please contact Joanne Gualda or Gemma Tillotson.